With the Directions widget, Google Maps version 4.30.0 brings turn-by-turn directions to iPhone lock screens, a new feature for the internet search giant's iOS app. Apple has offered similar, more robust lock screen navigation through its own Apple Maps app for years, so the addition is a welcome change for Google stalwarts. Available by swiping left on the iOS lock screen, activating Directions allows users to view a scrollable text listing of upcoming turn-by-turn navigation directions. After setting a start point and destination in the main Google Maps app, users can cycle through upcoming turns directly in the lock screen by tapping on two control arrows. Seen above, the implementation is not as rich as Apple's first-party solution, but comes in handy for those who prefer Google's mapping assets. Also new is an expansion to a location sharing feature introduced last month. Previously limited to the main Google Maps app, users can now share their current location in Messages by activating the included Google Maps applet for iMessage. 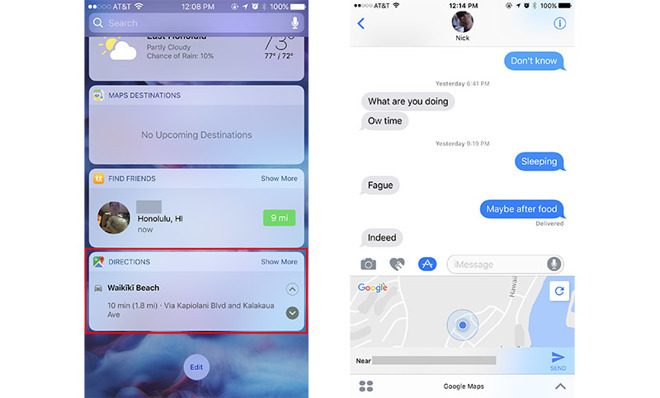 The location sharing function is nearly identical in nature to Apple's "Send My Current Location" feature, itself accessible by tapping on the "i" button in an open Messages pane. Locations are sent along with an image of a small map that, when tapped, opens Google Maps. Unlike Apple's "Share My Location" feature, also available in the details section of a Messages window, Google's location sharing feature is not dynamically updated. The latest Google Maps iteration also includes the usual bug fixes and performance improvements included with normal version updates. Google Maps is a free 125MB download from the iOS App Store.